This is one of those years when summer has never really settled into the mountains. The season feels fleeting and tenuous. The days are shortening (already…), and the weather has cooled. The weekend was misty up on the crest. Fireweed (Epilobium angustifolium) grows all over the West. It finds its way to disturbed areas after logging, fires, avalanches, and volcanic eruptions. Seems like I have always known it, growing up as I did among the clearcuts of southwest Washington. The hot pink spires of fireweed meant that it was almost time to go back to school. Fireweed means the downhill side of summer. I have known fireweed in north Idaho, when I was a young forestry technician measuring young trees in recently logged and planted clearcuts. Fireweed is a pioneer plant, growing profusely in the scraped bare soil. Sometimes it grew taller than me. We had to push through it, and the slightest touch caused the seed pods to burst. The seeds are silky and fluffy, like dandelions, only bigger. There are so many of them that the air fills with fluff, making it impossible to not breathe them in. I have known fireweed in Yellowstone National Park. After the wildfires of 1988, acres of burned landscape turned pink. I visited ten years later to attend a painting workshop, and was able to spend time closely examining the flowers. Many of the dead trees had turned silver and fallen. Fireweed and young lodgepole pines came up through the weathered down logs. The whole place was silver and black and green and pink. 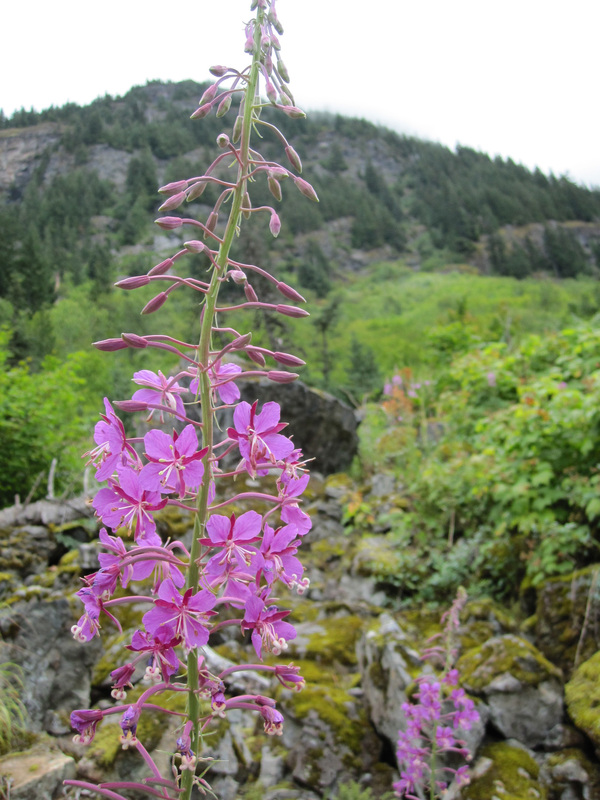 Today’s fireweed was photographed during a hike up Gold Creek. I found it in the tumbled boulders and alder brush of a slide path. I walked up to look at a recent avalanche that left hundreds of trees across the trail. Again, there was fireweed reaching for the sun after a change. I stopped to look at it–that assertive pinkness, the droplets of last night’s rain on the petals. Remembered being a kid not wanting to go back to school. Remembered the tickle of fluff in my nose. Remembered all the places I have walked after a fire. If things never changed, how could there be fireweed?